Trump's Transportation secretary Elaine Chao met with Taiwan President Tsai Ingwen in October. A U.S. Republican party foreign policy aide arrived in Taiwan Tuesday morning for a week-long visit, which might include a meeting with Taiwan President Tsai Ing-wen, after she congratulated U.S. President-elect Donald Trump during a phone call last Friday. It was November of 1987 when Stephan Yates, then a Mormon missionary, first arrived in Taiwan. He used to have to ride buses for many hours between major cities, including Changhwa and Kaohsiung, where he spent almost two years. Three decades later, much has changed. Modernized infrastructure and high-rise buildings are seen everywhere, along with high-speed rail that makes transportation much easier. Not to mention the matured Taiwan democracy where several peaceful shifts in power from one party to another have taken place. “If mainland China wants to establish a good relationship with the people of Taiwan, they must respect the political reform and democratization of Taiwan with the example of President-elect Trump,” Yates, now the chairman of the Idaho Republican Party, told VOA Tuesday. Keeping it low-key, Yates said he is not carrying any message to Tsai on behalf of Trump. 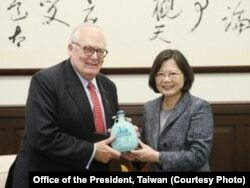 Heritage Foundation President Edwin Feulner met with Taiwan President Tsai Ingwen in October. Feulner was reported to have insider knowledge of Trump-Tsai call. While Trump’s conversation with Tsai has brought solemn protest from China, the call reflects the views of Yates and many other hard-line Republican advisers, who urge Trump to openly take a tough stand against China. Officials from China’s Ministry of Foreign Affairs spoke with U.S. Ambassador to China Max Baucus to lodge an objection last Saturday. In Washington, the State Department said the call did not undermine the current U.S. “One China" policy. China claims democratically ruled Taiwan is part of its territory and has never renounced the use of military force to bring the island under Beijing's control. The United States broke diplomatic ties with Taiwan in 1979. In the 1979 U.S.-China Joint Communique, the U.S. recognized Beijing as the sole legal government of China, acknowledging the Chinese position that there is but one China and Taiwan is part of China. Taiwanese media reports indicated Tsai plans to transit through New York on her visit to Nicaragua in early January before Trump’s inauguration ceremony on January 20. News reports said Tsai might not meet with Trump in person but was planning to meet with Trump’s close aides. Republican congressman Dana Rohrabacher from California said the call sent a diplomatic warning to China. 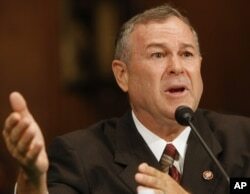 Rohrabacher was reportedly a potential candidate to be the next Secretary of State. FILE - Rep. Dana Rohrabacher, R-Calif., testifies on Capitol Hill in Washington. Former U.S. ambassador to the United Nations John Bolton, who also emerged as a contender to be the next top U.S. diplomat, said it was time to shake up U.S.-China relations, noting China’s “aggressive and belligerent claims” in the South China Sea. Both advocated for comprehensive U.S. arms sales to Taiwan to deter “China’s covetous gaze,” and fulfill the U.S. commitment under the Taiwan Relations Act. Both advisors said the so-called Asia Pivot policy has been a failure under President Barack Obama and has invited Chinese aggression in the East and South China Seas, according to an article published by Foreign Policy magazine in early November. But some regional experts voiced deep concern. “It will likely raise expectations in Taiwan of a pending shift in the U.S. ‘One China’ policy that is not likely to be forthcoming. Beijing will probably seek to exact a price from the new Trump administration and will be deeply mistrustful of him and his new team,” said Bonnie Glaser who is director of the China Power project at the Center for Strategic and International Studies. “The U.S. should strengthen ties with Taiwan, but in a substantive rather than a symbolic way. Let's negotiate a free trade agreement with Taiwan, and encourage other countries to do so as well,” Glaser added. There are also others in Trump's cabinet who have been supporters of upgrading Taiwan's status. Georgia Republican congressman Tom Price, picked by Trump to be his Secretary of Health and Human Services, sponsored a congressional bill in September to give a greenlight to high-level Taiwanese officials to meet with State Department officials. The so-called Taiwan Travel Act states "it should be the U.S. policy to permit high-level Taiwanese officials to enter the United States under respect conditions and to meet with U.S. officials, including officials from the Department of State and the Department of Defense. " It also advocates an upgrade of Taiwan's quasi-official representation, the so-called Taipei Economic and Cultural Representative Office (TECRO) to conduct official business in the United States.